In case you missed it, Google AdWords has recently updated some of the guidelines for participants in their Google Grants program. For those not familiar with Google Ad Grants, it’s a program offered by Google that provides a monthly grant of $10,000 to eligible non-profit organizations which may be used towards advertising on their AdWords platform. There are reportedly 35,000 organizations currently using this program, despite Google limiting these non-profits to only a fraction of the total features available on the ad platform. Google is now notifying these organizations about significant changes happening to their grants program. In email notifications sent to non-profits towards mid-December 2017, Google informed participating advertisers that as of Jan 1st 2018, they will be subject to new rules that they need to adhere to, or risk being kicked out of the program. Below are the main changes taking place, and what non-profit advertisers can actually do to make sure they comply. Some non-profits struggle to extract much value from their grants accounts. They therefore allow their campaigns to run across all countries, even if they offer no services or potential donors in those countries. The logic is that at least they get traffic and show Google that they are putting their grant money to work. The new guidelines require advertisers to target specific countries with their campaigns. Implementing this is simple, as you can see in the image below. We recommend selecting any potential countries where you may be able to reach the people you help or your donors. Clearly this will limit the traffic coming into the site, but if structured properly, your campaign will be able to drive quality traffic from relevant countries, while using up the entire $10,000 budget allocated by Google. When looking at many grants accounts, we’ve often noticed that the campaigns have a sloppy structure. Most often it’s due to a lack of AdWords experience by the account manager, which can be anyone from the Office Manager to the Director of Development at the non-profit. A poorly structured account that is not well-maintained, results in poor account performance which effectively prevents you from receiving traffic from many of the more competitive keywords. Google now requires grants participants to have a minimum of 2 active ad groups with relevant keywords and 2 text ads each. It’s something that is easy to overlook if you have lots of campaigns in your account. But even with larger accounts, it should take no more than a few hours to review and fix. Sitelinks are the extra links that appear right below your AdWords text ads. They tend to improve your overall Click-through Rates (CTR) and campaign performance. Adding these extensions is an easy fix that will deliver a quick CTR boost to your campaigns. It also shows Google that you are using your grants account properly and are taking advantage of some of their most highly recommended features. The best way to add sitelinks is to choose a few pages on your site that are of interest to potential visitors, such as “our mission.” “about us,” “partner with us,” or “contact us” pages, and link directly to them. Your CTR is an indicator or how relevant your ads are to your keywords. They ultimately impact how much you will pay per click and how often Google will choose to show your ads for the keywords you are targeting. Google is now requiring grants participants to maintain a minimum 5% CTR for their account. If the CTR requirement isn’t met for 2 consecutive months, your account will be cancelled. This allows them to ensure that your ads will not pollute their search results pages with meaningless and irrelevant messages just because you’re getting this traffic for free. Of all the new policy changes, this may be the most significant. It will require that your break out ad groups that have lots of unrelated keywords into ad groups where all the keywords are similar to one another and write relevant ads that specifically address the keywords in each ad group. It also means that if you have totally irrelevant keywords in your account, you may need to delete them, as getting a 5% CTR for these terms may be impossible. As written above, you may need to delete keywords that are not at all relevant to your website or organization. Most of these keywords will likely have keyword-level quality scores (Google’s rating of the quality and relevance of your keywords and PPC ads) of 2 or less. You may be able to improve your quality scores by writing more relevant ads as well. 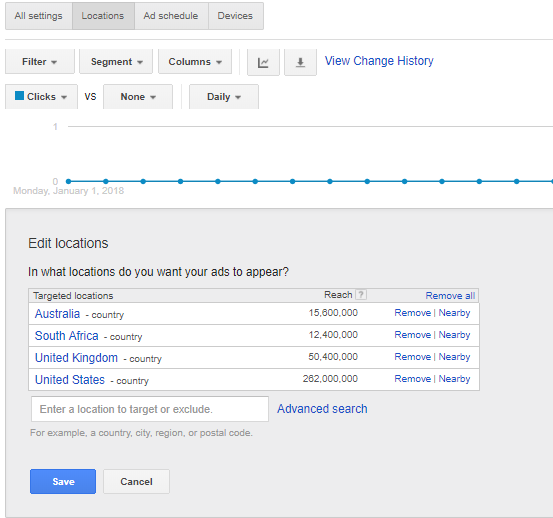 The best way to address this is by logging into AdWords and going to the keywords tab across all your campaigns. 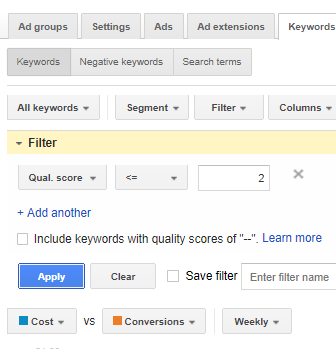 Once you see a list of all your keywords, create a filter for all keywords with a quality score of 2 or less. Then review these keywords one-by-one and decide which ones are relevant to what your organization does, and which ones are not. Irrelevant keywords should be deleted, while relevant ones should be broken out into independent ad groups with ads that specifically address those keywords in their text. The only way to really fix this specific issue is to review every keyword in your account and decide if it’s compliant, and if not, decide whether it’s worth risking your ad grant to just leave it in. The last set of changes are about the quality of your website. The site you send grants traffic to should belong to the organization, be clear about your mission and be legitimately non-profit. While the changes listed above seem to make the Google Grants program less enticing than ever, there’s one significant update that may compensate for all these new restrictions; the removal of Google’s $2 bid cap. As you may know, one of the main restrictions within the grants program is that advertisers may not bid above $2 per click for any keywords. With the new batch of program changes, Google has lifted this cap and now allows advertisers that switch from manual CPC bidding to automated bidding to raise their bids above $2. So if your account includes keywords that are converting well, you can bid more aggressively for them and improve your average position, thereby driving more traffic and conversions. While all these changes may seem like a pain to implement, they ultimately force advertisers to think more creatively about how to use their grants and build campaigns that drive relevant, high quality traffic rather than low quality, non-converting clicks. Once we all revamp our campaigns to adjust to these guidelines, we will likely all be better off and better positioned to enjoy all the benefits of the Google Grants program.